Taking a break from promoting her book ‘What Happened,’ Hillary Clinton visited Swansea University to accept an honorary UK Doctorate degree. Hillary Clinton has received an honorary doctorate from Swansea University during a visit to the city. The former US secretary of state and 2016 American presidential candidate was presented with the award during a ceremony at Swansea University’s Bay Campus. She said the honour “meant the world to her”. The university’s College of Law was also renamed the Hillary Rodham Clinton School of Law. In her speech, Mrs Clinton praised the leadership at Swansea University and the support of the community which she said “has been transforming the university into a world class hub for academic pursuit, as well as the pursuit of truth, reason and innovation”. Kirsty Lloyd, the Welsh Biochemistry student, who protested Clinton, blasted her to the London Economic Times. “Hillary Clinton cheated Bernie Saunders of his nomination. And all those drone strikes that killed women and children which are illegal contradict the reason she is being given a doctorate – which is for doing things for women and children all over the world. The main thing she’s done for women and children is kill them drone strikes,” said Lloyd. 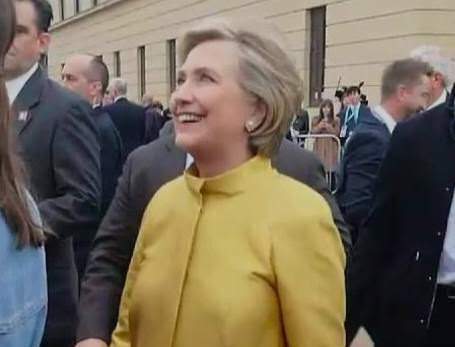 Clinton ignored the comments and walked away surrounded by heavy security. In another incident, Clinton and aide Huma Abedin exited a black Mercedes van to boos both cheers and boos from the crowd.